We sometimes wonder why Christians turn to all manner of “self-help” books, strategies, exercises and gurus. Do we not have sufficient tools in the Christian’s biblical toolbox to help people who struggle in their daily lives? Is Christianity truly for the sweet by-and-by, offering little practical guidance for day to day living? It’s not that Scripture doesn’t offer such guidance; it’s that Lutherans, at least, don’t know the Bible well enough to know where to look for such advice and counsel. If you don’t know where to look, then for a start, look at our reading from 2 Peter! 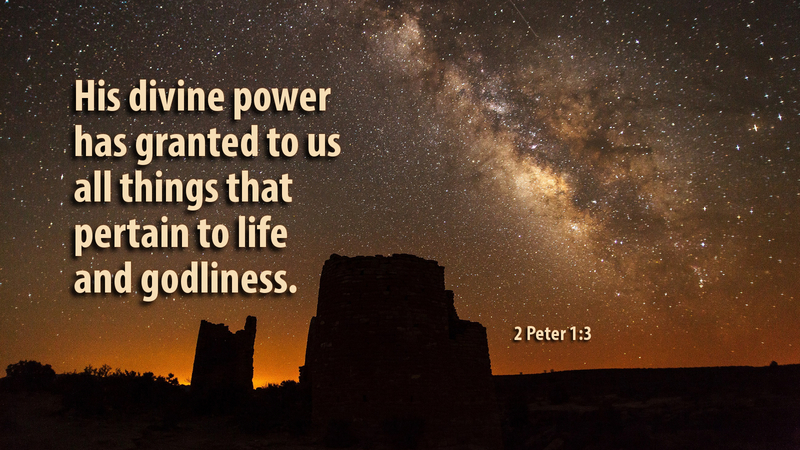 The beauty in this passage is that Peter begins by reminding us that, in His divine power, God has granted to us all things that pertain to life and godliness. He does this through the knowledge of Him, Christ Jesus, who calls us to share in His own glory and excellence! We are not called and gifted for mediocrity, but to share in Christ’s own glory and excellence! And then Peter goes on to tell us how to incorporate this glory and excellence, putting it into practice in our lives. Prayer: Almighty Father, thank you for granting us these gifts and promises, that we may have healthy, joyful lives as followers and disciples of Jesus Christ. Amen. Advent Action: Write the verse above on a card—and then make several copies to share with those who may need God’s help in their lives.